As of July 2011, Nevada’s unemployment rate remains the highest in the nation at a crippling 12.9 percent, the Bureau of Labor Statistics recently reported. California’s unemployment was the second highest, hovering at 12.0 percent, with Michigan and South Carolina still struggling with 10.9 percent unemployment. Rhode Island had the fifth highest unemployment at 10.8 percent. 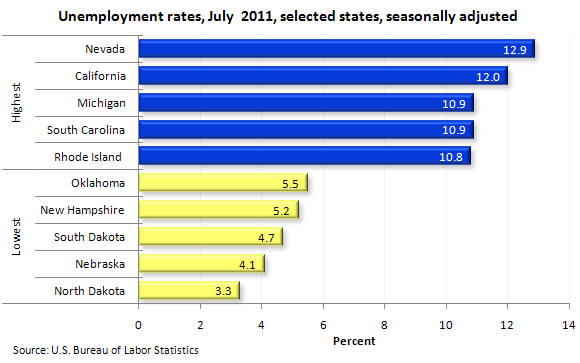 In total, nine states still carry the weight of unemployment rates over 10 percent. North Dakota had the lowest unemployment rate in the country at 3.3 percent – a far cry from the national average of 9.1 percent. Nebraska enjoys the second lowest unemployment rate of 4.1 percent, with South Dakota at 4.7 percent. Still in the top five lowest unemployment rates, New Hampshire came in at 5.2 percent with Oklahoma close by at 5.5 percent unemployment.